Thomas W. Baldwin, Vital Records of Cohasset, Massachusetts, to the year 1850, Boston: Wright & Potter Printing Company, (1916) , p. 170. Thomas W. Baldwin, Vital Records of Cohasset, Massachusetts, to the year 1850, Boston: Wright & Potter Printing Company, (1916) , p. 227. Samuel A. Bates, Records of the Town of Braintree 1640 to 1793, , at https://books.google.com/books?id=24Y-AAAAYAAJ . Randolph, Mass. : Daniel H. Huxford, (1886) , p. 662. Samuel A. Bates, Records of the Town of Braintree 1640 to 1793, , at https://books.google.com/books?id=24Y-AAAAYAAJ . Randolph, Mass. : Daniel H. Huxford, (1886) , p. 725. 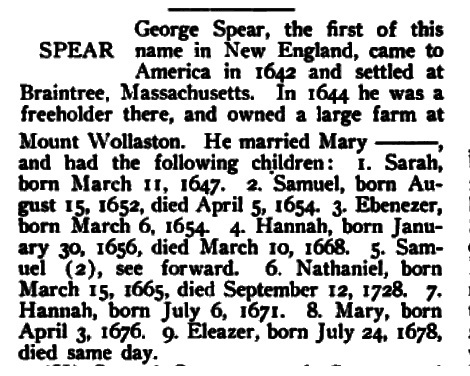 Verne Raymond Spear, The descendants of George Spear who settled at Braintree, Massachusetts, 1642-1988, , at https://books.google.com/books?id=xVFVAAAAMAAJ . West Springfield, Mass. : Trade Press, (1988) , p. 17. William Richard Cutter, Genealogical and personal memoirs relating to the families of Boston and eastern Massachusetts, New York: Lewis historical Pub. Co., (1908) , Vol. 1, p. 483. Samuel A. Bates, Records of the Town of Braintree 1640 to 1793, , at https://books.google.com/books?id=24Y-AAAAYAAJ . Randolph, Mass. : Daniel H. Huxford, (1886) , p. 718. Kendall P. Hayward, "The Seven Daughters of Simon Bryant", The American Genealogist Vol. 30 (1953): p. 15-17. 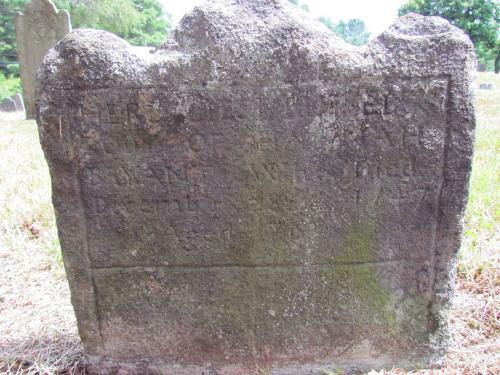 Find A Grave Memorial# 43495047. Samuel A. Bates, Records of the Town of Braintree 1640 to 1793, , at https://books.google.com/books?id=24Y-AAAAYAAJ . Randolph, Mass. : Daniel H. Huxford, (1886) , Vol. 1 : Pg. 206. Samuel A. Bates, Records of the Town of Braintree 1640 to 1793, , at https://books.google.com/books?id=24Y-AAAAYAAJ . Randolph, Mass. : Daniel H. Huxford, (1886) , p. 670. Samuel A. Bates, Records of the Town of Braintree 1640 to 1793, , at https://books.google.com/books?id=24Y-AAAAYAAJ . Randolph, Mass. : Daniel H. Huxford, (1886) , p. 691. Samuel A. Bates, Records of the Town of Braintree 1640 to 1793, , at https://books.google.com/books?id=24Y-AAAAYAAJ . Randolph, Mass. : Daniel H. Huxford, (1886) , p. 724.